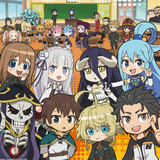 I’m happy to introduce the newest bit of content I’ll be bringing to you on Crunchyroll. This is the first in a new series of articles which showcase a single mangaka, focusing on their background, style, and work. For our first piece, I will be introducing one of my personal favorites, Tsutomu Nihei! Popular phrases used to describe Nihei’s work are cyberpunk, dystopic, post-dystopic, and post-apocalyptic, but none of these accurately describe the universe in which he writes. His stories reach so far into the future and outside of our realm of experience that they might better be described as a sort of grim space opera. Nihei mixes the almost-prophetic far-reaching style of storytelling of William Gibson and populates his worlds with unknowable horrors of impossible scope and power reminiscent of Lovecraft, then illustrates it all with a Giger aesthetic. 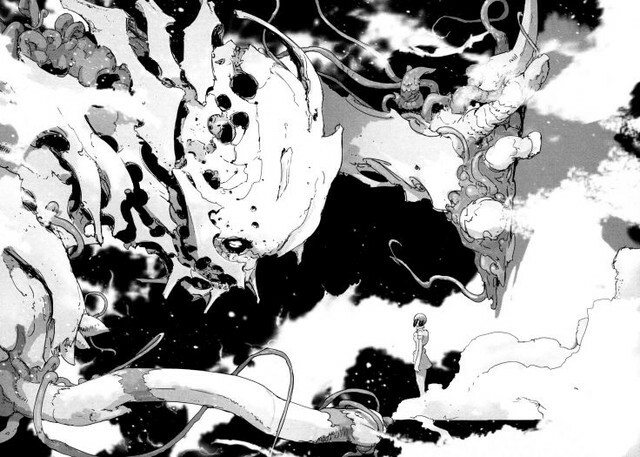 Nihei’s art is dark, disturbing, and lovingly detailed. His meticulous style and grand architectural designs are art in their own right. Nihei is the prognosticator of nightmares from the end of time and his works are capable of capturing a dark beauty from terrible horrors. 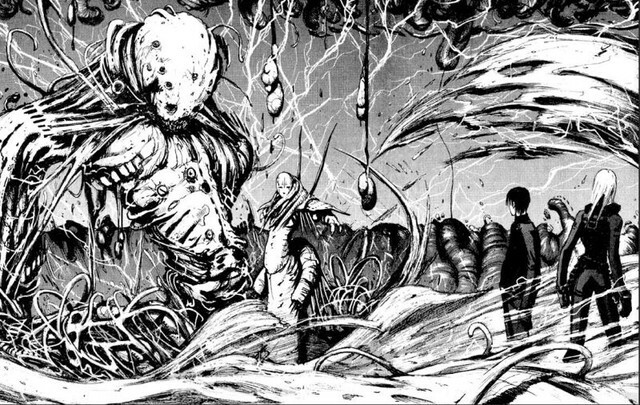 As mangaka go, Tsutomu Nihei is a rather enigmatic figure. Save for a few short interviews, there isn’t a great deal of information out there describing Nihei’s early life and development as an artist. He is popularly known for having studied architecture and working briefly for a construction firm in New York before travelling back to Japan where he pursued a career in manga. 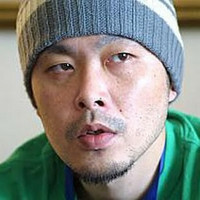 Nihei was hired by the Kodansha’s magazine Afternoon and worked as an assistant to Tsutomu Takahashi illustrating Jiraishin. 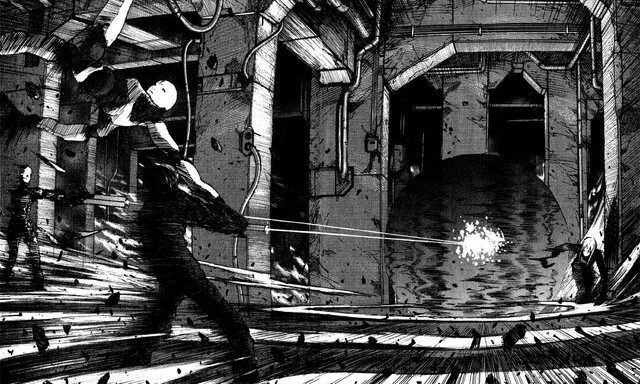 While narratively a far cry from Nihei’s dark post-cyberpunk, Jiraishin has many visual and tonal themes which may have influenced Nihei’s work. Jiraishin a hard-boiled detective series, had very simplistic character designs with an art style which made use of strong contrast between dark and light. Emotionally, it is absolutely desolate, a land where happiness is fiction and characters are lucky to simply exist above absolute hopelessness. Most prominently, violence is quick and brutal, illustrating how quickly a life--and the human skull--can be destroyed by a single bullet. 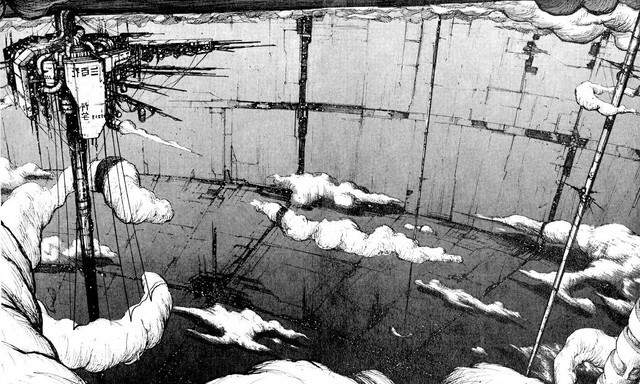 Nihei’s breakout piece was published in Afternoon alongside Jiraishin in 1997. Of all his works, Blame! is Nihei in his purest form and firmly enmeshed him into the fabric of cyberpunk culture. Blame! followed Killy, an enigmatic character wandering through the innards of a massive building known only as the Megastructure, seeking a human with a pure genetic code able to access the ubiquitous administrative network called the Netsphere. As Nihei’s first work, Blame! was notable for how remarkably different it was from popular stylistic tropes in modern manga. His characters were simple and expressionless, dialogue was extremely limited, and his method of storytelling was minimalistic. Blame! ultimately spanned 10 volumes of Killy’s travels through imaginative, intricate, and perhaps even impossible environments. Killy eventually forms a partnership with an engineer named Cibo and the two encounter sporadic groups representing the remnants of humanity and fighting or fleeing from impossibly strong silicon-based lifeforms called Safeguards. 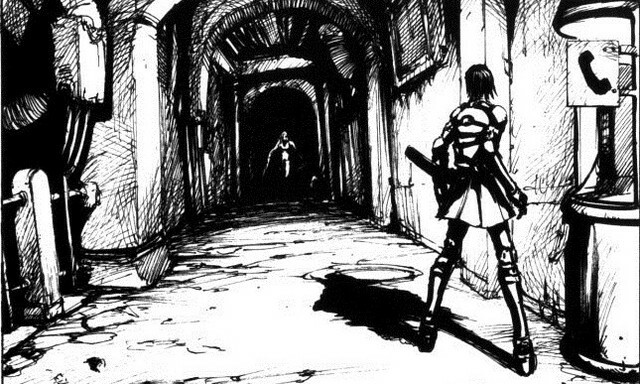 After Blame!, Nihei released two direct spin-offs of the setting. NOiSE was a prequel following a female police officer of the not-quite-as-distant future investigating a series of mysterious murders linked to cyber cult activity. The single volume release contained plenty of hints as to the events which may have eventually resulting in the world of Blame!, tantalizingly indicating that the passage of time between the two stories may be measured in millennia of violence and stagnation. Net Sphere Engineer takes place an unspecified period of time after Killy’s quest and follows an Engineer tasked with hunting down Safeguards, once again providing a number of clues regarding the ambiguous ending of Blame! and the consequences of Killy’s actions. Biomega was Nihei’s next anthology to see release on Afternoon in 2004. Eventually reaching 6 volumes, Biomega followed Zoichi Kanoe, an agent working for a mega-corporation known as TOA Heavy Industries, and his AI companion programmed into his motorcycle named Fuyu Kanoe. Gone are the endless hallways and unimaginably high ceilings of the Megastructure in favor of more traditional cyberpunk super cities. There are many similarities between Biomega and Blame! as both follow an enigmatic wanderer seeking a individual with unique genetic code and accompanied by a more tech-savvy female counterpart. Stylistically, Biomega shifted away from Blame!’s emphasis on overwhelming strength during combat to the supremacy of high speed combat. The antagonists were reminiscent of the silicon life from Blame! but had taken on a significantly more biological appearance. 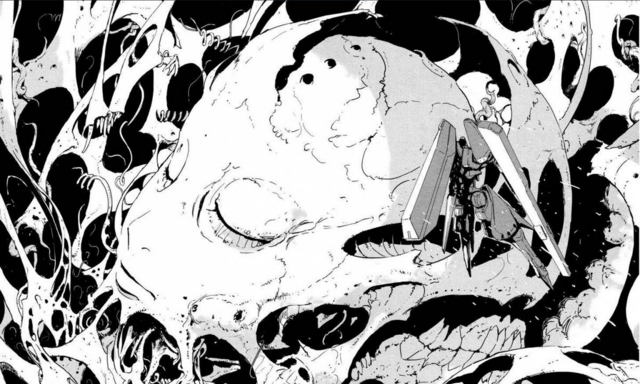 Knights of Sidonia is Nihei’s most recent work, first released in 2009 and still ongoing. 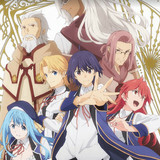 It follows Nagate Tanikaze, the last purely genetic human on a seed ship trying to find a new home for humanity after the destruction of the Earth by a mysterious alien race known as Gauna. Tanikaze is a ace mech pilot defending Sidonia against its Gauna pursuers. Fans of this series unfamiliar with the rest of Nihei’s work might be surprised to learn that this is by far his most light-hearted series, employing a Evangelion style of storytelling in which the characters participate in a number of hijinks and awkward romances between extremely deadly missions. 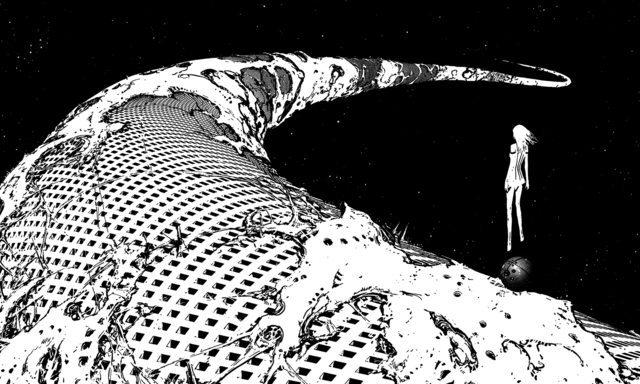 Nihei takes many of his usual tropes to a grand scale, featuring enemies the size of asteroids, an intricately designed mothership featuring a vertical city lining its interior, and armies of meticulously drawn mechs. After several failed attempts to licence Blame! into an animated property into anything more than a few short and unsatisfying OAVs, Knights of Sidonia is Nihei’s first series to see a full anime adaptation which has met with a great deal of success and may revive hope for some of his other series. 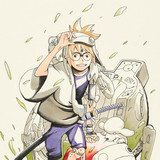 Among Nihei’s other works are a number of shorts including brief and tantalizing introductions into other worlds including Abara, a series in which an engineered virus allows people to mold their bones into weapons, an extremely disturbing zombie short called Dead Heads, and a five-issue short partnered with Marvel called Snikt!. One of the greatest pleasures of following Nihei’s work is witnessing his growth and stylistic development as an artist. Even in his earliest work, his environmental design and plethora of synthetic monsters was easily among the most imaginative in the industry. With each new title he has taken major steps in shoring up his weaknesses. His characters have developed more individualized and expressive features. His Giger-esque creatures have grown increasingly organic and less human in appearance, taking on more fascinatingly alien shapes. 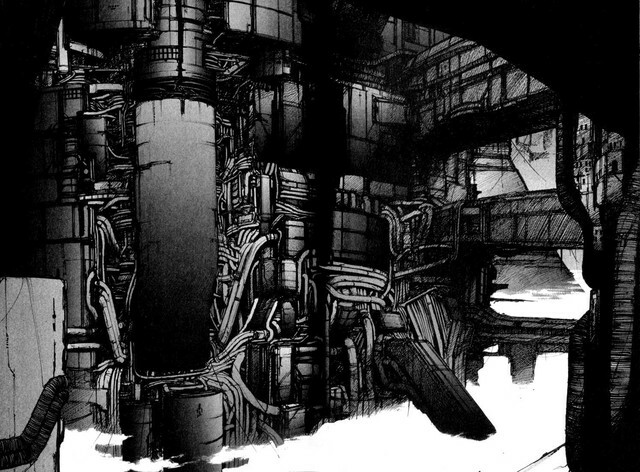 Nihei has also diversified his strengths, taking his amazing architectural designs from the closed megastructure of Blame! to the cityscapes of Biomega, and finally expanding into space, organic environments, and alien planetary surfaces in Knights of Sidonia. Nihei may just be the living personification of the concept “show, don’t tell” His style of storytelling has been described as “decompressed” and, in his early works, almost seemed geared toward showcasing his world. A complete absence of exposition, limited character dialogue, and a philosophy against handholding allowed the reader to slow down, appreciate each panel, look for small clues, and draw inferences. 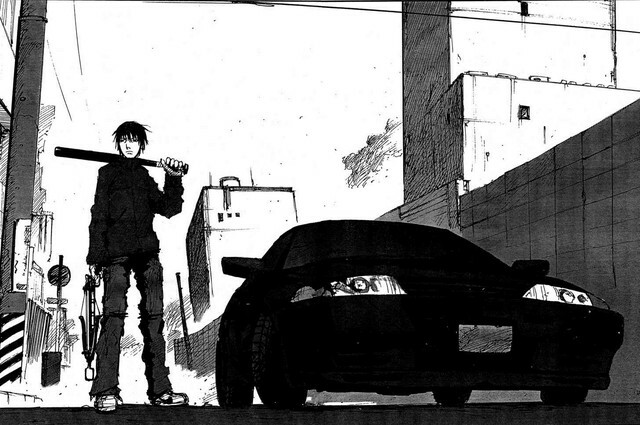 Along with the visual development of his characters, Nihei has also given them a greater variety of personalities. Biomega and especially Knights of Sidonia have each seen a massive increase in the number of recurring characters and amount of dialogue. Nihei has kept true to his style of scarcity while adapting it with a making it more approachable. One especially satisfying aspect of following Nihei’s work is that many are seeded with small clues, much like the works of Quentin Tarantino and Stephen King, that all his seemingly unrelated stories take place within the same universe. Chief among these is the reappearance of the ubiquitous TOA Heavy Industries. 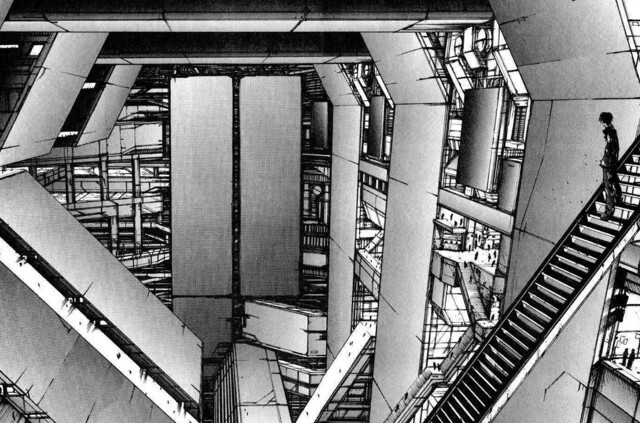 The corporation, or at the very least their facilities, inevitably play an influential role in all three of Nihei’s major series. 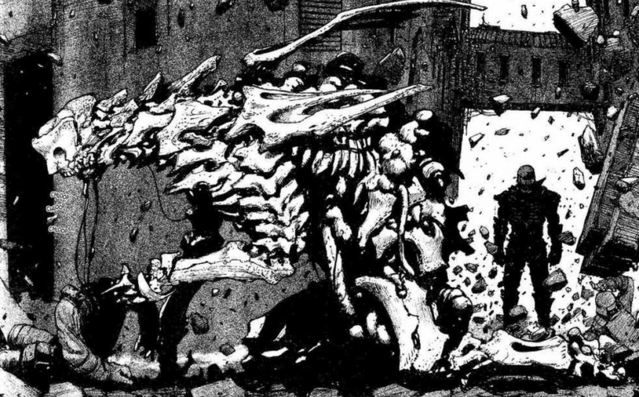 The use of the word Gauna to describe the genetic monsters in Abara and the aliens in Knights of Sidonia, as well as the resemblance of the monsters and events in Biomega and Knights of Sidonia seem much more than coincidental. Many of his works feature stories that could conceivably have occurred within the same universe, although likely separated by millennia, prompting a large number of fan theories regarding a probable timeline linking all of Nihei’s works. 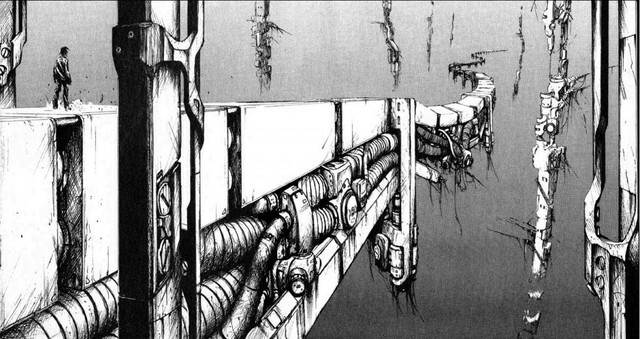 Unsurprisingly, Nihei’s work explores some seriously dark themes, most commonly the insignificance of humanity. The scope of power in antagonists in his stories often approach cathonic magnitude The majority of his tales take place either during or after extinction level events, leaving vanishingly small groups left attempting to rebuild or simply survive the threat of predation. Often it is often implied that humanity has a hand in the creation of these forces which ultimately destroy them. Higher concepts such as morality are all but absent from his work which, matched with the sheer brutality of the violence in his series, gives the impression that his work may be a meditation on the cruelty of nature. Survival of the fittest is the only rule that matters and Nihei elevates this concept to a scale in which humans are nothing more than plankton in a deadly ocean. Despite the harsh treatment, Nihei does seem to credit some special status to humanity. He has some sort of obsession with the concept of a “pure” human, and those who remain with untainted human genetics are often a major focus of his stories. Perhaps the reason for this is simply that, when the last vestiges of humanity have been pushed so close to the brink of extinction that they resort to genetic or synthetic modification simply to survive, any who manage to avoid death on their own merit must be special. The how of it aside, pure humans are always a prominent feature in his works. 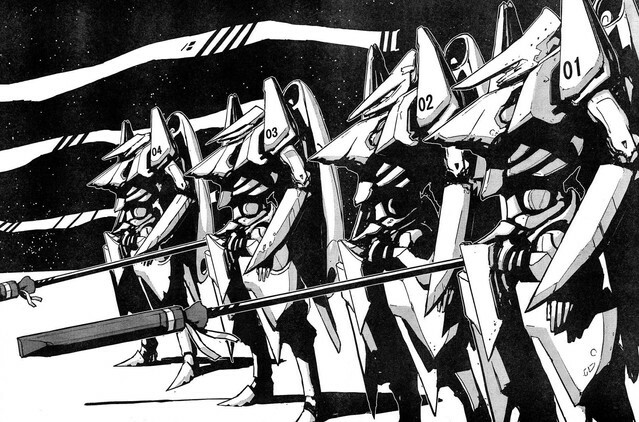 The main thrust of the plot for Nihei’s first two series was a question for a pure human, Killy seeking a human genes capable of accessing the Net Sphere and Zoichi’s assignment to secure an individual immune to the biology-changing N5S virus, while Knights of Sidonia’s protagonist Tanikaze is the only (mostly) unaltered human left on the Sidonia. It can be difficult to follow Nihei’s work since it really isn’t for the faint of heart. Reading his manga requires a bit more effort than most fiction since you have to fully engage yourself in every page. His style slows the reader and forces them to look for the story rather than allowing themselves to be spoon fed every twist and turn in the plot. It is a journey that is both difficult and usually more than a bit traumatic, but it is also unbelievably rewarding. Every realization is that much more satisfying since it requires you to individually piece it together. Every rereading feels like a new experience because you make more connections drawn from your past experience. This dynamic between story and reader alone is unique and particularly notable matched with their abnormal and grandiose settings. Nihei is truly one of the most remarkable writers out there and a must read for any fan of science fiction. 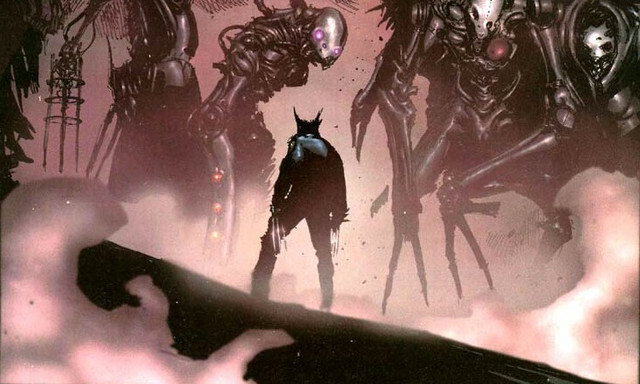 So that wraps up our first Monthly Mangaka Spotlight--are you a Tsutomu Nihei fan? Which of his works are your favorite? Next month, we're focusing on Hiro Mashima of Rave Master and Fairy Tail fame, but who else would you like to see? 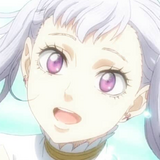 Let us know which mangaka you want to learn more about in MONTHLY MANGAKA SPOTLIGHT!